Patients who have sufficiently low heart rates or electrical blocks (“heart block”) of conduction may require an electrical device (a pacemaker) to provide the missing heart beats. More minor forms of electrical block, particularly in the absence of symptoms do not necessarily require a pacemaker. Depending where the electrical wiring fault lies, would indicate what type of pacemaker is implanted. Generally, there are 2 main types: single chamber pacemakers where only either the atria or ventricle needs pacing, or dual chamber pacemakers, where both atria and ventricles need pacing. A pacemaker consists of a box (about 4 cm X 3 cm) containing a battery and some computer technology, that transmits electrical pulses down an attached wire (called a lead) to the heart muscle. In most cases, two leads are used. The box itself is placed directly under the skin usually just below the collar bone. The whole procedure in performed under local anaesthetic with mild sedation. The incision scar will be about 5 cm long. The electrical leads are then introduced via the vein running under the collar bone, and passed to the heart. This is done with X-ray guidance, and the lead or leads passed into the right atrium and or right ventricle or both. They burrow into the heart muscle and are either anchored in or corkscrewed so they won’t displace. The free ends of the leads outside the vein are then attached to the pacemaker box. The electrical integrity of the circuit is then checked to see whether the pacemaker works and the wound is closed with sutures. The patient may be given antibiotics for the procedure and painkillers. Usually, the patient stays in overnight and the pacemaker is rechecked the next morning and a chest X-ray performed. The pacing check involves a metal probe placed on the front wall of the chest that “interrogates” the device below the skin. After discharge from the hospital, the pacemaker is rechecked at one month then yearly in a special pacemaker clinic. Occasionally in the early period after implantation, a lead can displace which would not be felt by the patient, but would be detected by the testing. In such cases, the lead would be re-positioned as a minor surgical procedure. The battery generally lasts between 5-10 years but is checked regularly for battery life. When the pacemaker check reveals battery life diminishing, the box is replaced as a minor surgical procedure. The battery does not diminish its power progressively, but gives at least a years’ warning that it needs replacing. If the main problem is a slow heart rate, then a single lead pacemaker implant is required that is attached to the atrium to drive the heart rhythm. 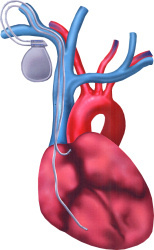 If there is a fault in the electrical connection between atrium and ventricle, then a dual chamber implant is required. In this case there is one electrode in the atrial muscle and one in the ventricular muscle. Complications of the procedure are few, but include lead displacement that is easily fixed, wound infections and bruising. Also, at the time of inserting the leads through the veins under the collar bone, the adjacent lung can be “nicked”. This is called a pneumothorax, where air then rushes in around the lung. It is not usually of major significance, and is easily treated with a drainage tube.